The best of Now - a Northeastern spring - on a plate. These are just-blanched wood nettles, on the left. When I pick them I lop off just the top two pairs of leaves, where the stalk is still very tender. Yes, they are very prickly. After 2-3 minutes in boiling water the stings dissolve and the stem is tender enough to eat. Then I refresh in cold water, to keep the colour. 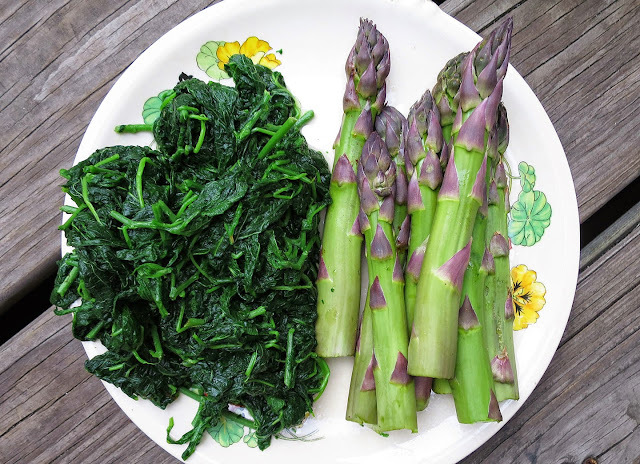 On the right, very beautiful New Jersey asparagus. I wish the botanical walks you do were a thing in my area (central MD).